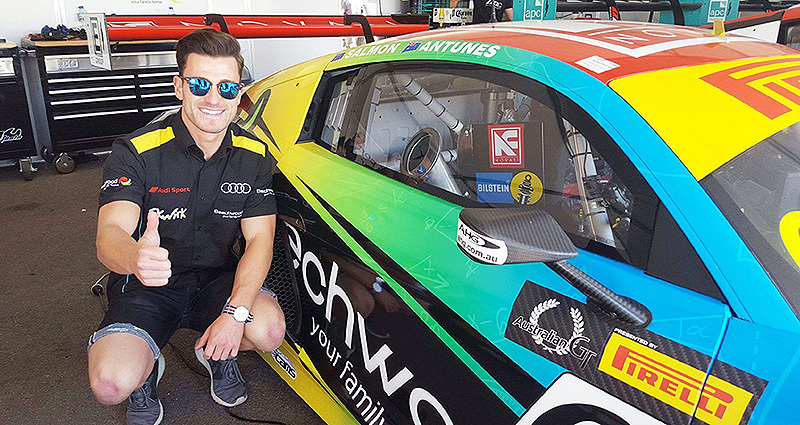 After a successful weekend on the Adelaide street circuit in the Skwirk / Beechwood Homes Audi R8 LMS Ultra last weekend, I am now 2nd overall in the 2015 Australian GT Championships with three more rounds to go. The weekend started off on Friday morning bright and early with our only practice session starting at 7am. 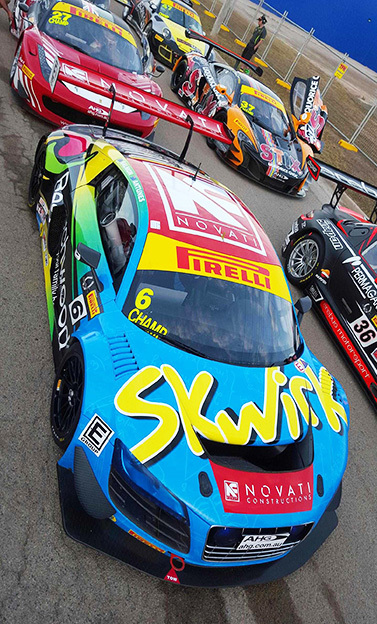 Australian GT were the first category to hit the circuit and boy was it exciting. The track was very dusty which made it slippery and difficult to gauge a good car set up. Nevertheless it was great track time to get re-familiarised with the track where Rod and I won last year in the Trophy Championship. Ric Kemp and the Melbourne Performance Centre team have a great base set up with the Audi R8 LMS Ultra so with the car already feeling quite good and the first qualifying session only a couple hours after we opted to go into qualifying without any changes to the car due to the track conditions likely to be very similar to practice. The session was very busy with the strong 33 car field all looking for clear track to be able to bank a fast lap time. It was tough to find clear track without pushing the tyres too hard but on the final lap of the session I was able to set a time good enough for 3rd place. This wasn’t the final grid position standing as grid position would be determined by the fastest times combined over both Q1 and Q2. So the job wasn’t finished. On Saturday morning with very minor set up tweaks we were ready to go. The pace was over 1 second faster compared to session 1. Confidence was much higher from the day before, though it was going to be even tougher to get up the front of the grid. On my final and only clear lap I was able to improve on my Q1 time by over a second and held my 3rd place for the start of Race 1. With the car still feeling great we went into Race 1 with no changes and feeling great. Eventful from the start, I grabbed 2nd place behind the Ferrari of Lester after turn 2. The Ferrari’s were very strong on this circuit and I dropped another position to the Ferrari of D’Alberto. There was an early safety car right when the pit stop window opened and a last second decision by the team got me into the pits straight away to get my compulsory stop done early. As the race continued I was starting to have troubles with the brake pedal becoming quite long and inconsistent causing me to overshoot some of my braking points. I was in 8th position for quite a while and with everyone’s tyres starting to wear and overheat I was able to make a few spots in the dying stages of the race to cross the finish line in 5th. A post-race penalty to the car that crossed the line in 1st saw me move up to 4th where I would start for Race 2. I wasn’t happy with how the car changed throughout Race 1 so we after a long debrief and discussions with my engineer Ric Kemp we decided to change the car quite drastically for Race 2. 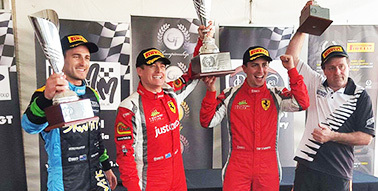 It was a big gamble but it paid off, we won Race 2 of the Australian GT Championship in Townsville! I had a great start, moving up to 2nd into turn 2. 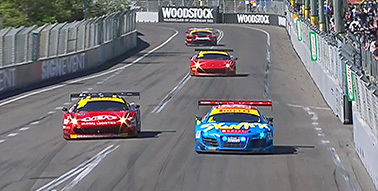 From there I had to make sure I was 100% perfect in order to keep the very fast Ferrari of Denyer and D’Alberto at bay. A safety car period with about 15 minutes to go opened up the track ahead of me and fortunately put some lapped traffic between me and D’Alberto which gave me a bit of a breather. My car become very tough to drive as the brakes and tyres quickly deteriorated, but the changes we made were spot on, and allowed me to keep a stronger pace for longer than in Race 1. 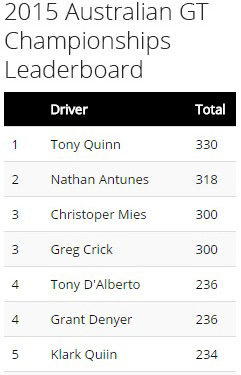 The result put me 2nd overall for the round and moved me up to 2nd in the 2015 Championship standings. A massive credit to my crew and engineer for putting it all together, I owe the race win to them! Thank to you everyone.